On these pages we discuss higher order categories. We take first order category theory as consisting of objects and arrows between them. By the addition of arrows between arrows (with appropriate axioms, these second level arrows are natural transformations). By allowing us to 'look inside' one layer of objects. We can then go on to higher order objects by continuing the process (such as arrows between arrows between arrows and so on). This is often described in terms of n-cells. Each higher order arrow has an extra shaft line. Another way to represent higher order categories is multicategories. In this case the arrows can have multiple inputs. 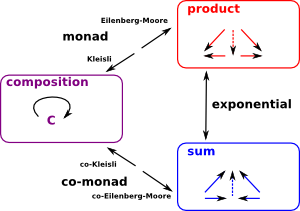 A given category 'C' with an endofunctor gives rise to a monad. By reversing the arrows (changing C to Cop) we can change the monad into a co-monad. open and closed subsets of a topological space. A category in which the hom-sets carry some extra structure, and that structure is preseved by function composition. There are a number of open source programs which can solve these algebra problems. I am using a free program called 'Axiom'. This page explains how to install and run this. On this page we discuss functional programming. Functions are not just code that will take in values and produce an output, functions can also be passed to and returned from other functions. On this page we discuss the mathematics of category theory. Category theory can be used as a possible foundation for the whole of mathematics. Category theory deals with links (functions, morphisms and so on) between a range of mathematical structures like sets. youtube video - Catsters - 2-categories 1 (Catsters 36) - The definition of (strict) 2-category. youtube video - Catsters - 2-categories 2 - The middle four interchange law in a 2-category comes from functoriality of the composition functor. youtube - Tom Leinster: "An introduction to n-categories"
youtube - Eugenia Cheng: "The periodic table of n-categories"